The last two weeks have gone pretty well. 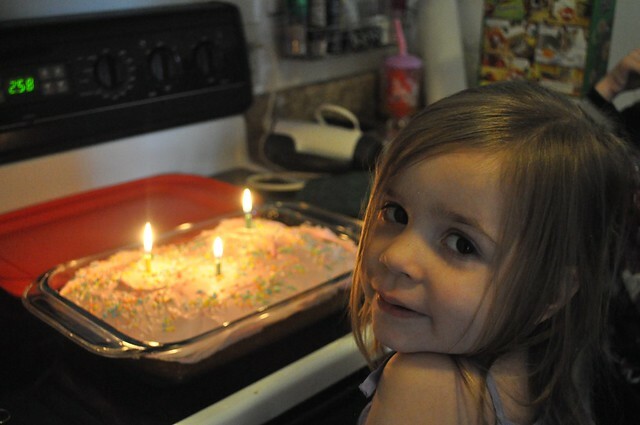 One of the biggest events of the 2 weeks was Sarah celebrating her 4th birthday. She had to have a pink cake! 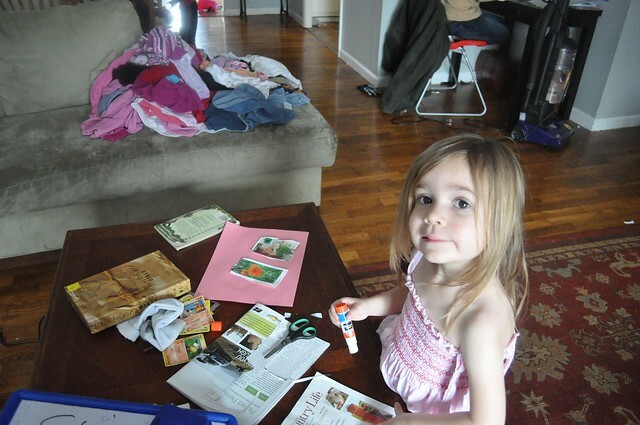 We've finished the first 2 weeks of Sonlight's Core F and we're enjoying it for the most part. I don't think the kids are enjoying the Encyclopedia, and I wish there was a "spine" book in addition to (or in place of?) the encyclopedia. We're loving our first Read Aloud - Where the Mountain Meets the Moon. All 4 kids have read Li Lun, Lad of Courage and Silkworms. The older three also read God's Adventurer. We've been reading through John. We take turns reading verses aloud, which is a great way for the kids to practice reading aloud and a bit of "public" speaking. Math is still going well ... they all four do their math without complaints. We also have restarted All About Spelling (Jada is about to finish level 1, and Joe and Rachel are both in level 2). We're also working our way through Writing with Ease (Jada in Level 1, Rachel just starting level 2, and Joe about to finish level 2). Now that we have Math under control it is much easier to get to these subjects that were getting skipped. For Science, Caleb has been studying Simple Machines. The other three have learned at about our atmosphere and about atmospheric pressure. 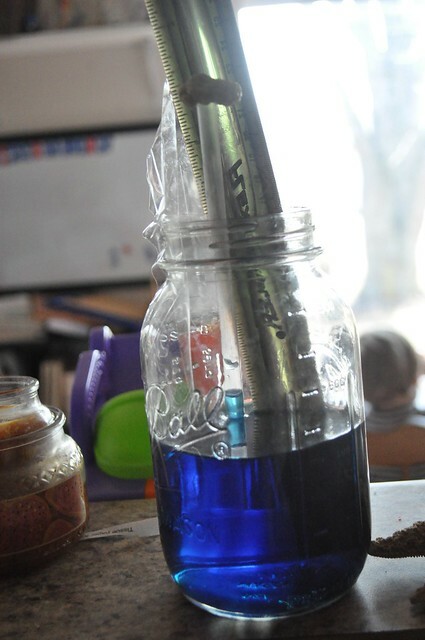 We finished up our week this week by making a barometer. I had trouble finding a clear straw, so we used a white one instead. We also had a lot of trouble keeping gum on hand to use for our project! Every time we'd buy some, a couple of little ones (who shall remain nameless, LOL) would chew it up. (In their defense, I think they probably had some help from the older kids). Our pathetic barometer. We're expecting some weather changes this weekend - so we'll see how it works! For Sarah and Alex, we're reading a book through the week and doing activities to go along with it ... kind of Five in A Row style. Last week we read Don't let the Pigeon Drive the Bus. This book is a fun one for kids! We kept things pretty simple last week. We acted out the story, with each one taking a turn being the Pigeon and begging to drive. We also made an adorable handprint pigeon that I found on Pinterest. I didn't have that color of paint - so I mixed green, white and blue until I got a color that was close. Sarah made a really cute one (and I love that it's her handprint - I may just have to frame it!). When I stuck Alex's hand in the paint, he freaked out and tried to wipe the paint off on his pants. Needless to say, we didn't end up with a handprint pigeon from him. We also sung "Wheels on the Bus" and watched a movie of "Wheels on the Bus" on Netflix. 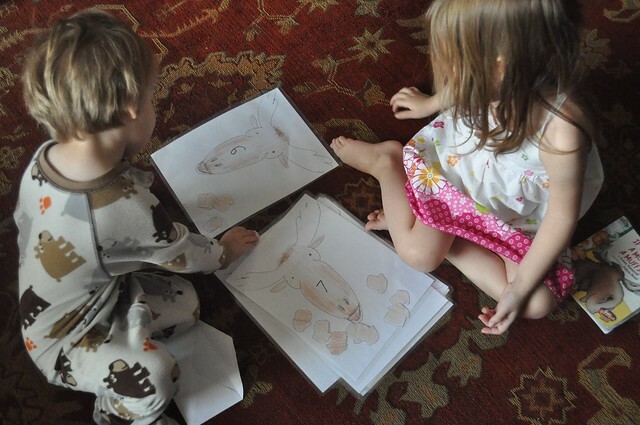 This week, we read If You Give a Moose a Muffin. 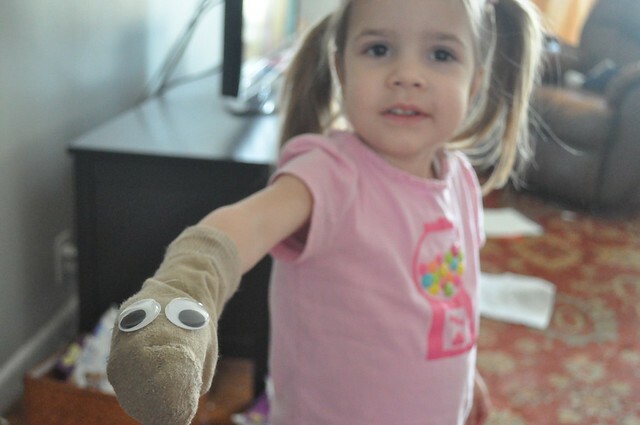 We made very simple sock puppets. They both loved these and have played with them all week. I just hot glued two wiggly eyes onto the sock. You could obviously be much more elaborate with these, but my two didn't seem to mind the simplicity. We also made muffins. 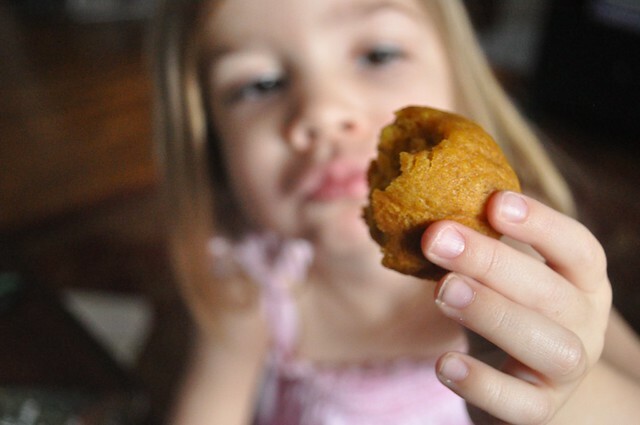 Sarah chose pumpkin muffins, and we made enough to not only for a snack, but also for our poetry tea on Friday morning. Sarah and Alex each ate 6 or 7 mini muffins, so I think they were happy with the handiwork! I looked for printables to go along with the book, but couldn't find anything, so I decided to make my own. I made Muffin Counting, where she had to count out the number of muffins on the moose. 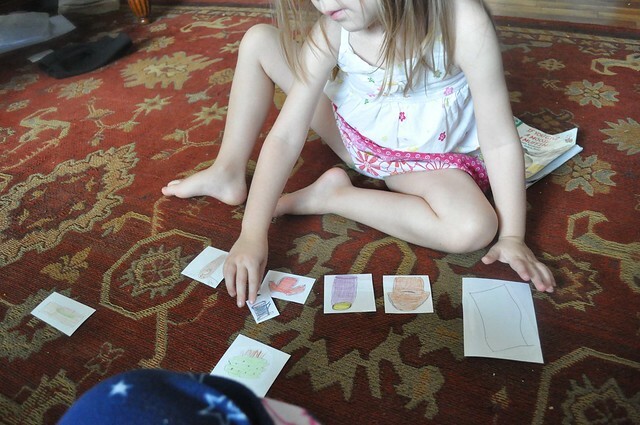 I also made some sequencing cards to practice sequencing. 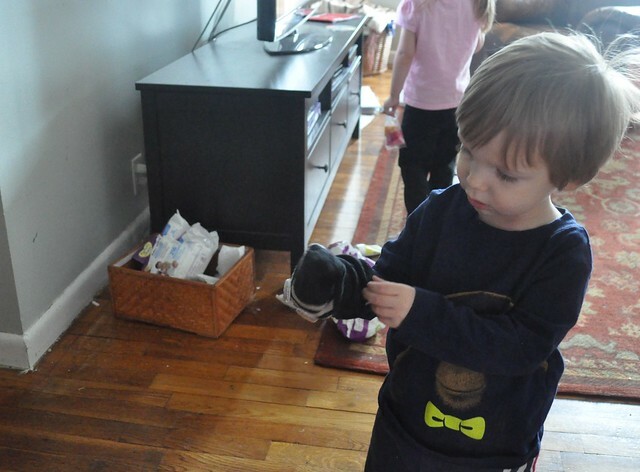 Alex trying to figure out his Sock Puppet.